I couldn’t help but wonder these things as I read “In the Night of Memory” by Linda LeGarde Grover. Her book, rich with emotion and thoughtfulness, took me to deep places I hadn’t planned to visit. As I journeyed with two sisters from a turbulent early childhood to a salvaged adulthood, I thought about how many real life stories this one must mirror. It invited me to think about abuse and restoration, about motherhood and larger family ties. Some “big thought” books can be a tough read. It can feel like the author is standing on a soap box, preaching down at you. Not so with this one. 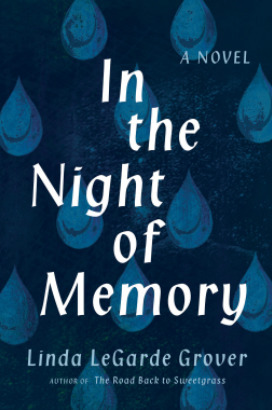 “In the Night of Memory” tells a story that is compelling with characters you want to root for. Its story completes the arch of two women’s lives without dragging on, nor does it rush. It is lyrical and beautifully told from start to finish. If you read “There, There” by Tommy Orange and loved it, this is definitely a read alike. What I loved about this one, though, is the focus on women and their stories. Linda LeGarde Grover tells her story with expertise and passion that spills off the page and invites the reader to learn and grow as they enjoy her story. *University of Minnesota Press provided me with a complimentary copy of this book in exchange for a fair and honest review.